Today begins Lollapalooza, the weekend-long music festival. I won’t be attending and I’ve never attended a Lollapalooza festival. However, just hearing the name “Lollapalooza” brings back memories from twenty years ago. In the summer of 1992, I was a 16-year-old on a Jewish teen trip called USY on Wheels. We were halfway into the trip when we arrived in Palo Alto, California. Our bus of 42 teens and four counselors pulled into the parking lot of our hotel and we immediately realized that we weren't the only tour bus in the parking lot. There were rows upon rows of fancy luxury tour buses with beautiful designs covering their entire exterior. It was only when we entered the hotel to check in to our rooms that we learned that all of the performers of Lollapalooza were guests of the same hotel. Waiting for the elevator I encountered Anthony Kiedis of the Red Hot Chili Peppers. I talked to him for a few minutes in front of the hotel elevator, until he explained that he was losing his voice from all of these back-to-back shows and needed to get some hot tea and go to bed. I remember laughing at the fact that this hard rocker with a reputation for partying was going to call it a night around 11:30 pm. One of the other members of the Chili Peppers turned to our group and told us not to do anything stupid at the hotel. Not thirty seconds later did we attempt to pack as many of us as possible into one elevator only to find ourselves stuck between floors. Fortunately for us, our bus driver’s husband was a firefighter and managed to save us before the local fire department arrived. That Saturday morning following our Shabbat services, a number of teens from our group met Pearl Jam front man Eddie Vedder by the hotel pool. Pearl Jam would soon become my favorite rock band (which it is to this day), but back in the summer of 1992 I hadn't even heard of them. Some of the teens in our group from New York had already become devoted fans of Pearl Jam and immediately recognized Eddie Vedder. Vedder and his girlfriend at the time, who had purple hair, were on their way to the tennis courts to hit some balls. While it was a USY policy not to use cameras on Shabbat, some of the teens in our group took pictures with Eddie Vedder. Some even had him autograph their paperback prayer books. When one of our counselors saw what was transpiring, things got interesting. The counselors explained to Eddie Vedder that we were a Jewish teenage group that was not supposed to be taking photographs on the Jewish Sabbath. Vedder pointed to his girlfriend and told the group that she was partially Jewish and that he respected our religious observance. One of the counselors told him that he and his girlfriend were invited to join us for our afternoon study session. (It is a tradition in the summer time to study Pirkei Avot, the Ethics of our Sages, on Shabbat afternoon.) The teens who had their prayer books autographed were reprimanded and then Eddie Vedder went on his way. If the story ended there, it would have made for a great anecdote of my summer experience. But twenty minutes into our study session in walked Eddie Vedder with his girlfriend. The teenagers began whispering and pointing to the back of the room at the surprise guest. What was usually a boring study session would became memorable. We left the hotel on Sunday and said our goodbyes to our new friends, which included rock stars, roadies and groupies. As our tour bus pulled away from the hotel parking lot we snapped our final photos of the tour buses. At the first highway rest stop I got off the bus, walked inside the store and purchased Pearl Jam's “Ten” on CD. I would listen to that album thousands of times over the next decade. And I would come back to it many times in the decade that followed. 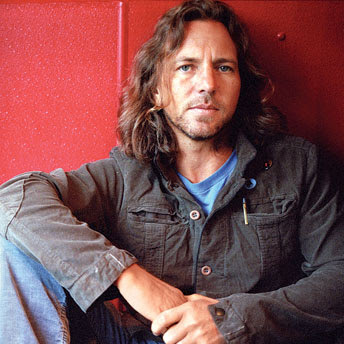 Eddie Vedder's music spoke to me during the rest of my teen years and into college. Last year to mark the twentieth anniversary of the release of “Ten,” Cameron Crowe produced a documentary called “Pearl Jam Twenty.” Watching the DVD at home late one night recently, I thought back to the memorable and life changing summer I spent on a tour bus out West twenty years ago. While I didn't even know who Eddie Vedder was as he sat in the back of the room at our Shabbat afternoon study session, just knowing that I had learned Torah with Eddie Vedder brought chills to my spine. I don't know if he ever studied Torah again after that one afternoon, but I sure feel blessed and honored to have witnessed the Jewish education of Eddie Vedder. This is awesome. Love Eddie. Great post Rabbi Jason!!! I'm not Jewish. I'm told my grandfather (who passed away the year my dad turned 18) was, and the older I get, the more interested I am in his faith. There's a family story about my great grandparents coming to the US from Germany during WWII for the obvious reasons. I came across this story gazing at Eddie Vedder on a complete and total whim...I don't know the purpose of my finding this article or even this random..soltitary reflection, I guess. I do know that I talked to God(in a serious, supplicant manner) for the first time in 10 years tonight and promptly forgot about it. Then I "happened" to come across a rabbi around my age on the net. And it reminded that there are no coincidences with God. Or is it Yahweh, to a Jewish person? If you read this, be vigilant and look for the small but profound ways God speaks to us. I guess maybe that's my point. And for posterity, Eddie Vedder still rocks. Major indication of my age, lol. That's pretty cool to meet Eddie. Pearl Jam is one of my all time favorite bands. It makes me feel good when you here positive things about a celebrity you like. Sounds like Anthony Kiedis was pretty cool too. Told you before that he was a liar who will disappoint you. He makes things up, he's pretentious because he's ambitious and fame driven, now his true color shows...integrity zero.